If you’re an ecommerce site, chances are that product comparison sites are an important source of traffic for you. Recently I had a customer ask about Google Product Search, and how to distinguish traffic from there from regular old Google organic searches. One option is using campaign-tagged URLs. If your product data shows up in Google Product Search, it’s probably because you’re providing the data through Google Base. You could add campaign tags to the URLs back to your site that you provide. You could make the Source be “google base” instead of just “google”, for example. But unless you have an easy, automated way to do that, it might require changing lots of URLs. It starts with “/products” instead. 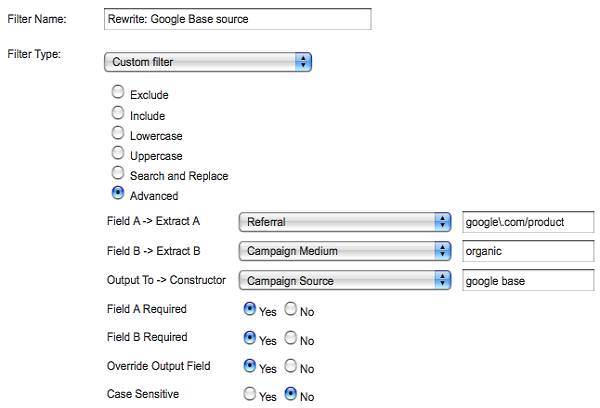 So we can use a filter that using the “Referrer” field (that’s web-geek speak for “where the visitor came from last”) to distinguish between these and change the Source field in your analytics data. The first part looks for a Referrer like the Google Product Search URL above. The second part limits it to only organic searches (since AdWords ads appear on the Google Product Search pages too, and we don’t want to screw up the attribution for those). The third part changes the Source to “google base” instead of just “google”. Now traffic is listed separately as “google / organic” and “google base / organic” so you can distinguish plain old search from product search. And if you drill down, you can still see the keywords for each of those individually. Remember that filters only apply from the time you create them going forward; this doesn’t reprocess any of your existing data.